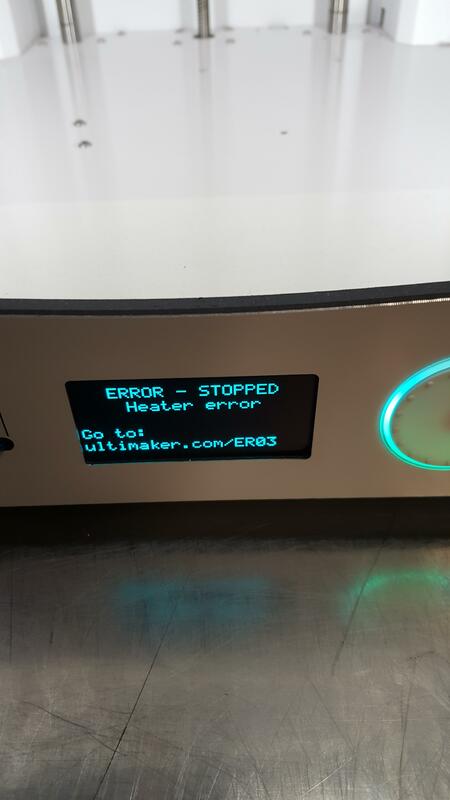 I told because im pushing the ultimaker over 250 temperature and the room i was printing is cold so i move it in a warm room this didn't help i also try ruining the fans on 20% and 0% same thing again. The thing is this will happen on random places over the print i decided to stay and watch the full print and see what happens prior to this so i had the temperature up in the menu to look what will happen it was between 255 to 253 but no dramatic changes while printing and then just before the error it start doping rapidly from 255 to 248 and the error appear i think i found what was going on for some reason on random it will make a big drop of plastic on the nozzle witch probably dissipate allot of heat when wrapped around the nozzle and that is the sudden drop in temperature see the image bellow. 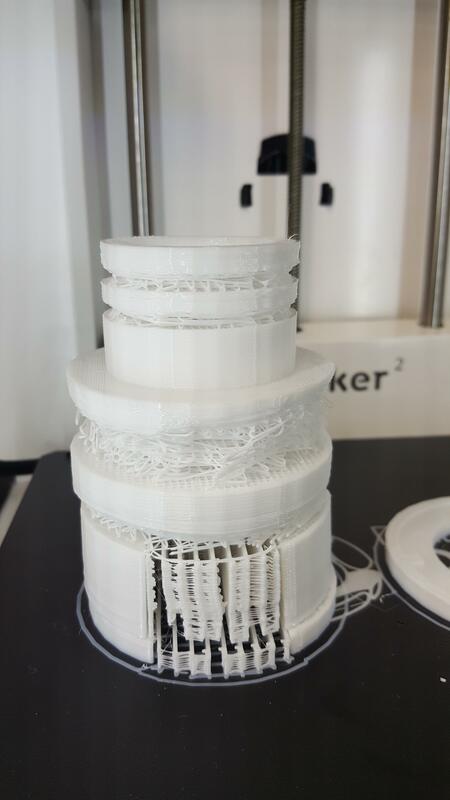 Is not the leveling of the plate is not warping print as i try sorting out all of this i level it probably 10 times i went from glue to painters tape to BuildTak same thing is not the filament roll tangling as i put it on the ground so it can feed without a problem. I really don't know what is going wrong. Please help i really don't know what to do any more. just set fans to 50% to get this part done. 1) The UM comes with a 25W heater which is plenty but yours might be lower as there is a large variation so you might only have a 20W heater and you are pushing it too far. But I also see you have an olsson block and this error is very common because your Olsson block is probably touching your fan shroud. So you can try to fix that - for example raise the block up higher by tightening that round nut (no disassembly necessary but heat the nozzle to 170C first in case there is plastic in the threads). Or you could put polyimide tape between the block and the fan shroud. Or you could remove the fan shroud. or lower it slightly by loosening the four screws and pushing down and tightening. or you could just run your fans at 50% instead of 100% (that will definitely help avoid this error!). 2) You could get rid of this error in the firmware. It's a safety thing in case your temp sensor falls out or your heater falls out but I have this disabled in my firmware and have printed for years with no problems. 3) Like I said, you can just get a 35W heater. So for example you could download cura version 14.09 and update your firmware using that firmware version. Cura is unique in that you can have dozens of versions all installed at the same time - each version is treated by windows as a completely independent , unrelated program. I already try putting the fans slow but no help i also turn them off and same thing. Thanks for the suggestions i will defiantly try them now and i will post update. Btw i just found when i go to maintenance in the ultimaker and if i start extruding material rapidly the temperature drops quickly and im able to do the same error without waiting for the print so probably i have as you said really week heater probably 20W and when material get extruded fast the temperature of the heater start plumbing. How much volume is this? I've printed 18 cubic mm/second at 240C without any noticable problem and with 25W heater - although like I said before I have this error disabled in firmware. ok thanks for the suggestions what i did is i drop from 0.8mm nozzle to 0.6mm and from print speed 50 to 30 also had to drop the shell to 1.2mm because of the nozzle and the print finish without getting the error. But now i have this problem help please. 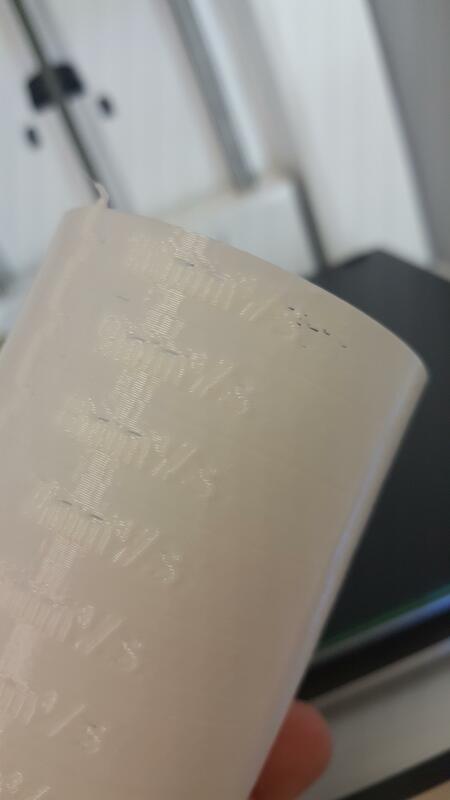 perfect print on 10mm^3 it started underextruding a bit but normal - Temperature haven't move even on the 10mm 254 255. I think something is wrong with your model. Open it in cura again and look at it in layer view. 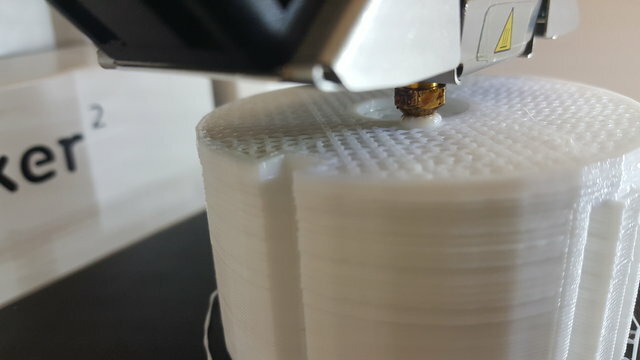 Is it skipping a cm here and there and just not printing at all? Either that or your extruder is getting clogged for an hour at a time and nothing comes out and then starts working again. It was not from the model i printed in PLA no problems perfect print every time. I will try using smaller nozzle and printing much slower. 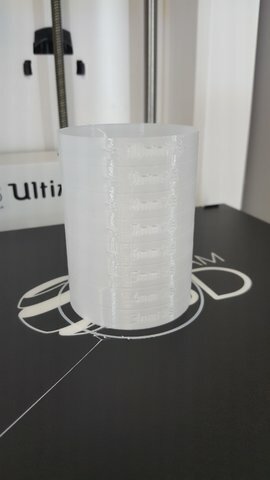 You printed with 18mm³/s on a UM2? Which feeder and nozzle did you use? Well I remember the first time the best and that was with a custom 0.7mm nozzle and was about 2 years ago and with (other than nozzle) original UM2 parts and was 18mm^3/sec. However I've been in those speed realms recently as well with the new "race" nozzles from 3dsolex and using the bondtech feeder. @gr5: Can you show a picture of the result of such a 18mm³/s print? They were all solid cubes and I was in the TUNE menu non stop increasing and decreasing speed to see how fast I could go such that the infill was still touching. Even if I found the cube it would be garbage because when I was at 20mm^3/s it was underextruding which was about half the time (half the time underextrucing) because I was constantly changing the speed. With a better feeder (meduza 2X or bondtech) and the RACE nozzles I can print quite a bit faster with a 0.8mm nozzle. Thanks for your info. Filament was the blue ultimaker PLA? Yes. That filament was popular back then and shipped with every printer because it matched the Ultimaker color scheme (note similar color on this web page here).